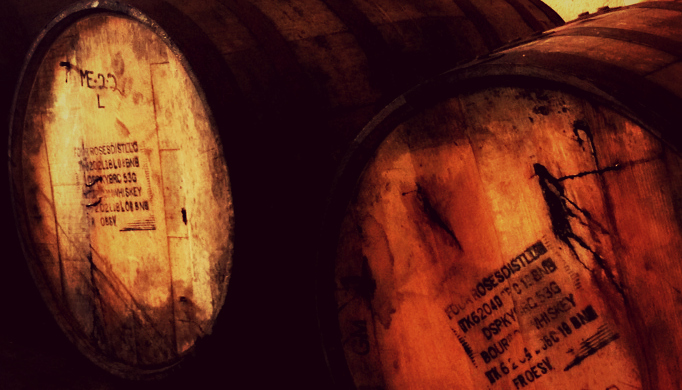 Whether you call it cask-strength or barrel-proof, it’s whiskey that puts hair on your chest. And we are seeing more and more of it on the market. Cask-strength whiskey is bottled directly from the barrel, completely unadulterated (meaning it hasn’t been diluted with water) and is generally between 60 to 65 percent ABV. Wondering why you should try this boozy beast? Hint: It’s not so that you can prove how tough you are. For some people, it’s the allure of tasting a whiskey that is undiluted, thus in a very pure form. For others, it’s because you can control the dilution yourself. Or perhaps you appreciate how the higher ABV tends to shine in certain cocktails where the drink naturally gets watered down in the process. Whatever your reason, even simple curiosity, these are seven cask-strength whiskies to try. Every time Angel’s Envy announces a new cask-strength iteration, it sells out almost immediately, regardless of price. Fewer than 8,000 bottles were released, but it’s worth getting your hands on one if you can. The spirit is aged for up to six years, then finished in ruby port wine casks made of French oak for three to six months. At 124.6 proof, the bourbonhas a complex aroma of berries and spice with flavors of caramel, coffee and dried figs. Meaning “the original” in Gaelic, A’bunadh focuses on traditional methods in its distillation, much the way that founder James Fleming would have made it. The whisky is non-chill filtered and matured in oloroso sherry butts. (Redbreast’s new Lustau Edition uses the same style of sherry casks.) Depending on the batch, the proof can vary slightly, but all of the bottlings share the same bold, complex flavors. The sherry scent comes out in the nose with baking spices and orange. More sherry and orange follow on the palate complemented by dried fruit and chocolate. Clyde May’s whiskey is dubbed Alabama style thanks to the oven-dried apples May used to steep in his brew. The difference is in the proof, which comes in at 117 versus the typical bottling strength of 92. The Cask Strength is aged for eight years, producing a spirit with flavors of apple, pepper and oak. Only 3,000 bottles were produced. Depending on the bottling, Four Roses uses one of two mash bills (75–20–5 and 60–35–5, corn/rye/malted barley) and one of five proprietary yeast strains. The Single Barrel uses a yeast that produces notes of caramel and vanilla along with the 60 percent corn mash bill. The result is floral and spicy on the nose with a mellow flavor that hints at stone fruit, as well as maple syrup and cocoa. The price point makes this bottle a steal. Crafted in the same manner as the familiar Jack Daniel’s, this potent brew is bottled between 125 and 140 proof. The same cave spring water, as well as the proprietary yeast and charcoal-mellowing process, that are used in the standard bottling are employed here. After the latter process, the spirit is placed in charred white American oak barrels and aged in the upper levels of the barrelhouse. The character of the Barrel Proof is influenced by the changes in weather and its effect on the wood, melding with the traditional vanilla and oak flavors that J.D. is known for and intensifying them. As the name suggests, this single-pot-still whiskey is aged for 12 years before emerging from the barrel at 117 proof. If the original 12 Year was complex, this bottling is even more so with the cask strength adding intensity to the flavors. All the flavors you would expect come through, from caramel and toffee to dried fruit and nuts. Think overproof sticky toffee pudding in a bottle. Aged eight years in new charred oak, this barrel-proof rye comes out at 121.5 proof versus the 92 proof of the standard bottle. The mash bill is a hefty 95 percent rye with 5 percent malted barley. The honeyed color leads to scents of caramel and an herbal note. In the mouth, there’s more caramel with spice, vanilla, leather and nuts.